A partial solar eclipse will be visible in southern South Africa, Antarctica, Tasmania, and most of New Zealand. This Friday (Nov. 25), a rather large partial eclipse of the sun will be on view — but only for a relatively small audience. 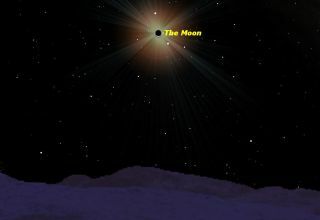 This will be the fourth time that a new moon will orbit between the sun and Earth to cause a solar eclipse in 2011, just one eclipse shy of the maximum for the number of solar eclipses in a given year. The first eclipse on Jan. 4 coincided with sunrise across Europe. And perhaps just a few penguins experienced a very slight eclipse a month later off Lutzlow-Holm Bay on the coast of Antarctica. On Friday, the moon's penumbral, or outer, shadow will brush the southern belly of the Earth, initially touching down in the South Atlantic Ocean, about 600 miles (1,000 kilometers) a southwest of Cape Town, but only managing to encompass the southern and western portion of South Africa, completely missing Lesotho and barely grazing the border of Namibia. The sun will be seen rising with a dent in its upper right rim. The axis of the Earth's shadow, containing the cone of darkness known as the umbra, from where we could see a total solar eclipse, misses Earth entirely, passing at its nearest, only about 0.05 of the Earth's radius, or about 210 miles (340 km) out in space. So the depth of this partial eclipse is greater than the three others that preceded it. At greatest eclipse, 90.5 percent of the sun's diameter will be covered as seen from the place nearest to the shadow axis, at a point in the Bellingshausen Sea along the west side of the Antarctic Peninsula. Here, the sun will be seen to dip to the southern horizon at the "midnight" of its 24-hour southern late spring day, and as it slowly ascends still very low to the south-southeast horizon it turns into a delicate boat-shaped crescent in eclipse; the horizon along which the dazzling boat goes rocking is that of "The Ice" (a nickname for Antarctica, being "on the ice"). As the penumbra slides under the bottom of the Earth, the partial eclipse is visible in varying extent across the icy land continent and just as it begins to slide back out into space it (just barely) manages to pass over Tasmania as well as portions of New Zealand's South Island. In fact, the last contact of the shadow with Earth occurs just to the west of the South Island, in the Tasman Sea. "Mag" denotes the fraction of the Sun's diameter that is covered at maximum eclipse. "Alt" is the altitude of the sun above the horizon at maximum eclipse; the width of your clenched fist held at arm’s length measures roughly 10 degrees. * Denotes Daylight Saving Time is in effect. If you have already obtained a calendar for 2012, be sure to put a big red circle around May 20. That is the date of the next solar eclipse and it promises to be a spectacular event. It will be an annular ("ring") eclipse that will be visible from parts of eight western U.S. states during the late-afternoon hours. For those living in parts of New Mexico and west Texas, the setting sun will be transformed into a blazing "ring of fire," in some cases lasting for more than five minutes. And across much of North America, the exception being those near and along the Atlantic Coast, the sun will appear partially eclipsed. Across the Pacific for parts of China and Japan, the annular eclipse will also be visible (Tokyo is directly in the eclipse track), although for Asia, being positioned to the left (west) of the International Date Line, this event will take place on the morning of May 21. Needless to say, in contrast to next Friday, next May's solar eclipse will have a huge viewing audience. Editor's note: If you snap a photo or video of the eclipse and want to share it with SPACE.com for a story or gallery, please email Clara Moskowitz at cmoskowitz@space.com and Denise Chow at dchow@space.com.